I started training in Tukido in 1991 when I was 14 years old, but not because I chose to. One unfortunate night I was attacked by a gang of girls, my friends ran away and I was left alone. I suffered physical and psychological injuries; becoming anxious, the attack caused me to lose confidence and self-esteem. With a background in martial arts, my father knew training could help rebuild my confidence, so unknown to me, he set out to find an art for me to train in and he found Tukido. When I had recovered physically he brought me to Master Tonner’s class in Irvine. At the time I thought it was to develop self-defence skills, but now I realise this was also to help me recover psychologically. I remember walking in to training for the first time and seeing people attacking a punch bag, breaking boards, it was noisy and I felt anxious, I just didn’t want to be there. I could not imagine myself ever being able to do that, and questioned if I wanted to do it? Taking no for an answer, my father insisted I take part, and so began the relationship with Tukido that would turn out to be a bond that would last a lifetime. I trained faithfully and regained my confidence and self-esteem, as I moved through the grades I became stronger than I had ever been, both physically and mentally. As I became a young adult, Tukido continued to shape my life, it gave me direction, it gave me goals and I became so focused. The Tukido way became so rooted within me that I remember being at school and bowing when I entered and exited the classroom, and keeping my hand raised when I asked the teacher a question. Tukido not only changed my life, at that point it became my life. By the time I reached 3rd Grade I was around 17 years old, I had progressed smoothly through the grades, but it was at this level I found my nemesis – the black board! I had struggled to break the board with side kick and then when I finally did, I injured my ankle bone on the horse, this caused me to be hesitant and although I felt as though I was able to strike the board with all my might, psychologically the board had me beaten, I was holding back and I could not find the courage to break it consistently. Nevertheless, I attended the grading for 2nd Grade and unsurprisingly, I failed. I was slowly talking myself out of continuing training and when I eventually passed the grading I convinced myself 1st Grade was not achievable due to my inability to break the black board and as a result I left Tukido. I may have physically left Tukido, but it was always in my heart. I had a brief return when I was about 19 years old, but by this time I was employed in the health and fitness industry and working evenings, I found it difficult to train consistently, so again I parted company with Tukido. Life then took me away from Scotland; I travelled abroad to Australia, New Zealand the Philippines and through Malaysia to Thailand. When I finished travelling I moved to Wales, but Tukido remained a part of me, I had even kept my suit, my sparring equipment, my belts and medals. I returned to Scotland in 2006 with my husband and had my son and daughter. As my children grew it was always my plan that I would return to Tukido, hopefully with them when they were old enough. It took longer than expected, but I made a return to Tukido in 2012, but it was to be short lived. I only trained for 6 months when I began experiencing sciatic pain. Following an MRI scan I was diagnosed with a herniated disc in my spine and I was again forced to leave Tukido. Refusing surgery I started yoga and then Pilates to help my flexibility and to strengthen my core. This time I was absolutely determined to return to training and although it took over 3 years, I finally made a full return to Tukido in February 2016. Coming back to Tukido this time has felt completely different; I have a different level of confidence and no longer have the black board mental block. I also enjoy the club in a different way, it feels more sociable than before and I have friends in not only Irvine, but in other Tukido clubs, it feels more like a family. I trained hard for the first six months to build my fitness and I attempted my first grading for 1st Grade in October 2016. I did not pass, but my mind-set was different, I did not feel defeated or feel pessimistic about future attempts, the feelings I had were the complete opposite. I was extremely motivated and determined and knew that the next time I went to the grading I would do it. I knew that passing would not just happen, I knew I had to work hard so I done everything I could to make sure I passed next time, I trained at home, I took part in extra sessions and I trained under Grandmaster Teh at The Palace of Art. The next grading was in December 2016 and I was as prepared as I could be. Those who were resitting started with destruction. First up was knife hand strike to the pine board, which I did not break in October, but this time my hand went through the board so easily, I was absolutely delighted to see my increased training pay off. Then it was reverse turning kick to the pine board; first attempt the board did not break, but on the second attempt I smashed it. 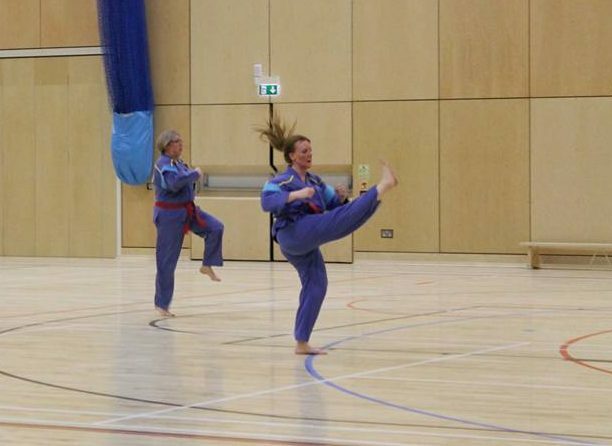 Then it was flying side kick, making sure I kept my supporting leg off the ground I went through the board first time, I was absolutely delighted, but nerves began to take over as my confidence grew and I knew it was all down to sparring forms. The Waves free direction went well, but it was during Rapids that I performed one punch incorrectly, but thankfully Grandmaster Teh allowed me the opportunity to perform it again and I immediately corrected my mistake and passed. I had done it; I had returned to Tukido and broke the mental block I experienced when I was younger. I was now in brand new territory with a renewed outlook on my future in Tukido. After the December grading the hard work has not stopped as I am now training for 1st Dan black belt at the 2017 Summer Camp. My determination is even greater, maybe because I feel that I’m not just doing this for myself, I want to achieve black belt for my father, to say thank you to him for finding Tukido and to show him what he always knew I was capable of. A part of me wants to do it for my children to show them what they can achieve with hard work, and I want to do it for me, not as an end to my Tukido journey, but to allow me to close this chapter and begin a new exciting new one as a black belt. I have no negativity only determination and I fully intend to train in Tukido for as long as I can. My experience in Tukido has been lengthy and disjointed, it has been happy and it has been frustrating, much like life with its ups and downs. I have come a long way from that unfortunate night when I was 14 years old and I am immensely proud to be fortunate enough to have Tukido in my life.